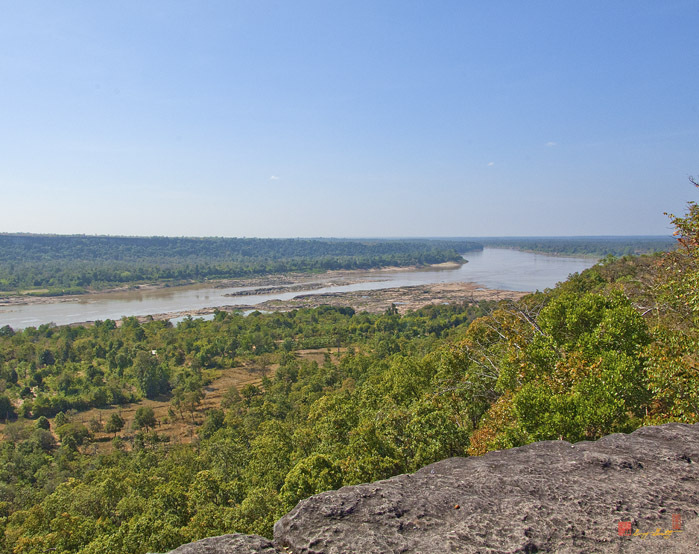 2007 Photograph, Pha Taem Park-View from Cliff Top, Pha Taem National Park, Ubon Ratchathani, Thailand, © 2014. This view shows the Mekong River and Laos beyond. The rock in the lower right corner is the same weathering resistant rock that forms the "mushroom tops" at Sao Chaliang. Much of Pha Taem is covered by this hard rock which makes it a very desolate terrain and a difficult place for trees to grow.